Now the Sixth Miss Hatfield has chosen a Seventh for the gift – and curse – of immortality. To never age, but to never belong in any time, to live untold centuries, but to never know family or home or sense of belonging, to even lose everything about yourself that made you other than Miss Hatfield. She has a mission for the Seventh Miss Hatfield – to retrieve a painting that belongs to her. But as Miss Hatfield tries to infiltrate the household that owns the painting, she quickly becomes connected to the people there, especially Henley, the owner’s son. She risks developing the very thing that can make immortality unbearable – love. I’ve also never seen a book that did so well in conveying the tragedy and loss of humanity. Oh the genre is full of immortal being angsting in corners and dealing out impressively overdramatic monologues about how terribly sad it is to live for ever, but few managed to convey the full grief and loss that comes with outliving everyone you love. The combination of being immortal and being lost in time is a beautiful and deeply sad tragedy. 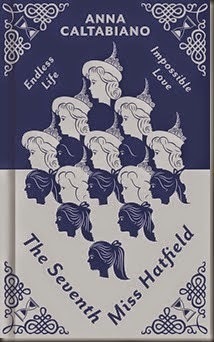 As we go along, we even see the slow loss of identity, exacerbated by her being a child until recently, we see how the Miss Hatfields are created as the 7th Miss Hatfield grows and learns – and forgets. The book also does a really good job of establishing the connections between the characters, creating a sense of realness to them and the way they interact so the loss is all the more poignant. It was a very nice romance. The characters were nicely realised, the relationships very real once we got past the convoluted beginnings. The emotion was strong and genuine. We had some lovely class issues that were addressed with the servants (including a beautiful moment when a servant questioned just how troubled and worried a wealthy lady can be considering how much peace and security she has in life) which was largely really well done and humanising (though it was shaky in places. Like one character is annoyed that they remember the names of their servants, including her personal maid and the butler. They may commonly be referred to by their surname, but it’s an absurdity that people in a house would not know the name of their butler or personal servant. Maybe the scullery maid, but not the upper servants). I kept expecting Miss Hatfield (Rebecca) to get the painting, finish up and then move to a different time and the woo continue. Or have more of the woo explained. Or spend more time with the 6th Miss Hatfield, but it never really happened beyond a little tucked at the end of the book. Of course, the time spent on the main story made the connections and the emotion all the more powerful and poignant which is the main selling point of this book and definitely where it shines. But the whole supernatural element of the book felt almost superfluous, like the bare bones of the story, the emotion, the relationship, the elements that truly mattered were all still there even if the woo-woo were removed. Which doesn’t make it a bad book, but it does make it a book that I, as a reader of Urban Fantasy and speculative fiction in general, was kind of left feeling I was the wrong audience for it. We have a number of female characters in the book including 2 Miss Hatfields and a lot of servants. There is a common thread of intelligence, determination and an unwillingness to be hounded by custom that fills many of them and generally they’re decent characters. There are also 2 visiting friends of the family. One is set up to be the mean girl and, sadly, fits the profile perfectly. The other is Blind, she also constitutes the only minority in the whole book. She’s Blind and pure and wonderful and inspirational and just too good for this world – it’s rather a trope and reached an almost angelic caricature rather than a full character; she was there to contrast against her vapid, beauty-obsessed sister. This book is a very good historical romance. It has some excellent character building, some great relationships and some very neat, elegant writing that really works. But the premise, the time travel/immortality elements, are forgotten for most of the plot (including the fact that Rebecca Hatfield is so young) and it left me slightly impatient – waiting for these elements to return and be an integral part of the story.